We eat sashimi at home all the time. I discovered in talking to some friends that this is unusual, even among sashimi fans. People pay a fortune for a few slices of fish in a restaurant or sushi shop when you can spend about $25 for more fish than two people can eat. Sashimi with a bowl of rice is one of the easiest and most delicious meals you can make. Here's a quick pictorial explanation. Here's the fish we bought: $34.82 worth. It's too much for two people for one dinner; we got two meals out of this. We probably should have left one of these at the store, but I knew I was going to take these photos and my wife said, what the hell, consider what we spend when we go out to dinner. We bought all of this fish at Nijiya Market in San Francisco. It's much easier to make a sashimi dinner when you have a local Japanese market, because as you can see, the fish is already scaled and trimmed, ready for the finishing touch. If you don't have access to such a market, ask your best local fish monger if they'll do that for you. If they won't, click here. Hirame is expensive: $40 a pound! But this was delicious, and it's not a huge piece. I will pay much more for fresh fish than previously frozen. Hirame is very delicate; don't overdo the soy sauce. When it's good, albacore -- the type of tuna that you usually eat from a can -- is one of my favorites. And not only that, it's cheaper than the more popular red-flesh tuna. This was outstanding, the best of all the fish in this meal. Tuna is the mainstay of most sashimi plates. It's pretty, has a firm texture, and you can smother it with other flavorings and it holds up well. I like toro (fatty tuna) but even at the supermarket it's really expensive, and this day they didn't have it fresh. Lesson #1: You have to buy what they have that looks good, not what you want. Here I broke rule #1. I love aji, and it's the only hikari-mono (shiny fish) Nijiya had on this day. But look at the edges of the fish at the top left: it's dry, not moist and beautiful like the other fish we bought. I knew better, but it was only $3.77 so we bought it anyway. It wasn't terrible, but it wasn't a great representation of aji. Rule #2: Suspect any sashimi on sale. I broke this rule here; that's an "on sale" sticker in the upper left, and look how cheap it is. Because katsuo is always slightly roasted to kill parasites that live in the skin, I thought it might not matter that it was previously frozen, and who knows, maybe they just got a huge shipment of katsuo and needed to move it. This katsuo was relatively flavorless; we ended up marinating it in garlic ponzu, which will make practically any animal flesh taste good. Next: slice it all up. 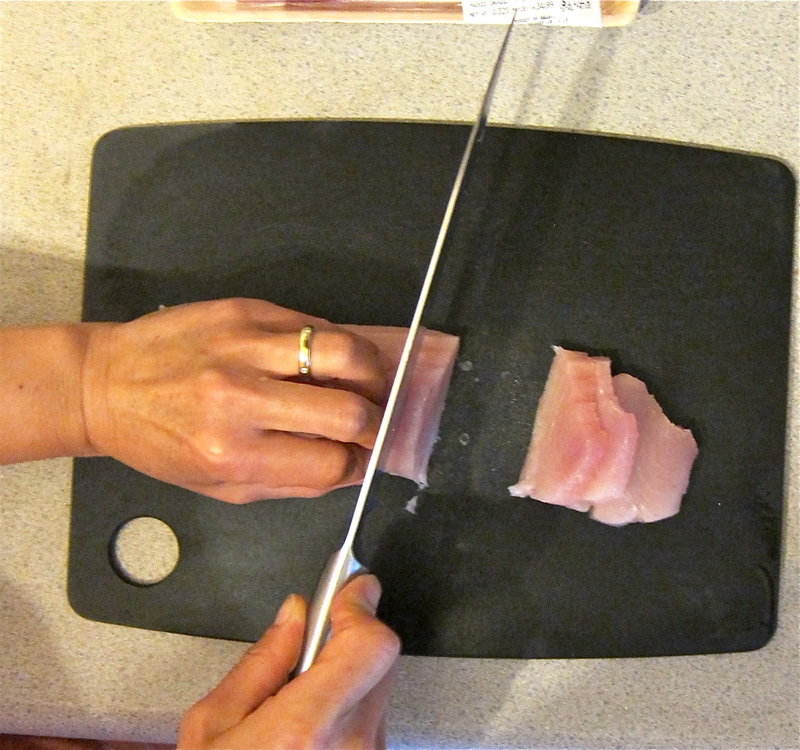 You need a very sharp knife for sashimi. We use a Shun, and we don't use it for anything else so that the edge stays sharp. Assuming you're not ready to go out and buy a new knife, use the sharpest one you have. Note how she holds the fish with her left hand, with her fingers against the knife. This is what our $34.82 worth of fish became: more sashimi than we can eat. The plastic container on the bottom right holds the fish we're saving for tomorrow -- although we didn't finish all of the sliced fish. Wrap any uneaten sashimi in plastic and refrigerate it. Sushi places do this; fish won't go bad overnight. But we either eat it all the next day, or freeze or cook it two days later. Other essentials. Good soy sauce, of course. We store it in the refrigerator. If you don't remember when you bought the open bottle in your closet, buy a new one. Ponzu has a stronger flavor and is a classic with katsuo tataki, but overwhelming for hirame or albacore. We also have tubes of wasabi (fresh is much better but not always available), ginger and garlic. My wife served the aji with a little ginger on top and the katsuo with garlic. Eat the garlic after everything else, and especially after the delicate white fish. I've never understood why people start a sushi meal with spicy tuna roll, but to each his own. Unshown is the rice we will have with this meal. Nothing special there: just rice. We prefer white rice to brown with sashimi because we don't want anything to overpower the fish. You can drink white wine with sashimi -- unoaked, crisp and clean is best. There's a reason so many US sushi bars have Oregon Pinot Gris as a wine choice. But we prefer sake. With some delicate fish we like a light but flavorful sake; in my ice bucket is a Masumi Nanago Junmai Daiginjo. We drink it out of white wine glasses so we can appreciate the aroma. If you have any sashimi or sake questions, you can put them in the comments and I'll answer as best I can. Kampai! Awesome! Great post; thank you. I will go out and find somewhere that sells sashimi grade fish (hell, I live in Vancouver, there must be hundreds) and surprise my wife, who loves sashimi! Thanks, Chris! In Vancouver you should be golden, I found three online: Fujiya, Sakuraya and Suzuya. And there's probably more. I should caution you that if you have used the same knife for poultry (especially) or meat -- we don't, but you probably don't want to splurge on a new knife -- clean it very well. You might rinse it with alcohol. Hey Blake, thanks for the follow up and the suggestions on where to buy sashimi. Given my ridiculous expenditures so far on different wine glasses, I think my wife might leave me if I were to go to the next level and buy a dedicated sashimi knife. So I appreciate the advise on cleaning with alcohol, which I will follow. I'm inspired and will be heading to Nijiya shortly... thanks for this guide. How much does it matter that the fish is labeled as "sashimi grade" or some such? Does that indicate anything about safety or just general quality? Would making sashimi from whatever's in the cooler at Safeway be risking a night at the porcelain opera? 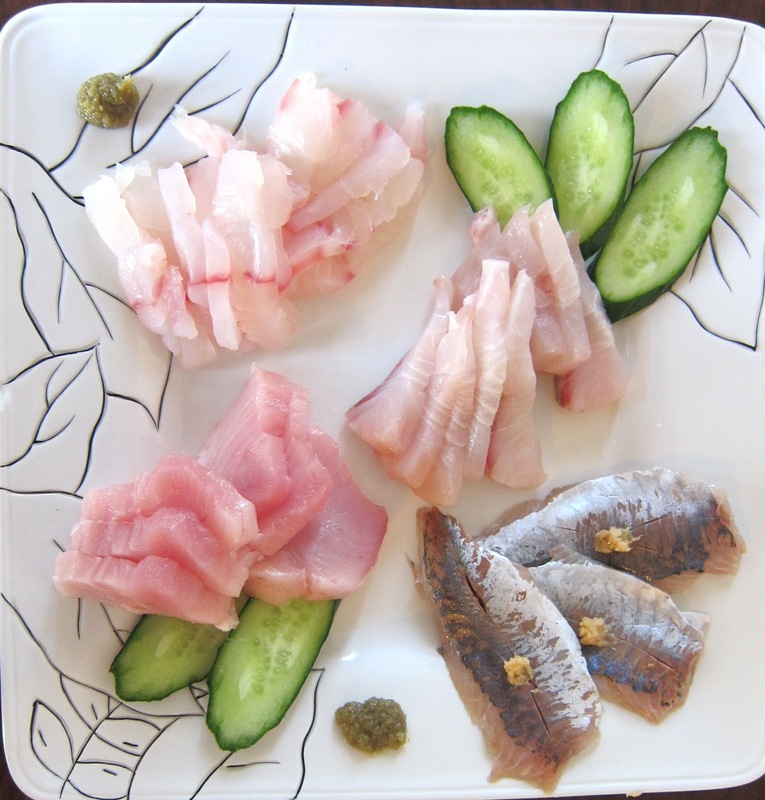 James: True "sashimi-grade" pieces of fish is better for most of us for a few reasons. You can reasonably hope that it has been deboned, and it should be the smoothest, easiest part of the fish to eat. Professional chefs and experienced amateurs turn ordinary fish into sashimi-grade every day, though. So it can be just a marketing word, and you'll note that Nijiya doesn't use it. As for safety, it's a good question. We will cook fish that we feel like has been sitting around a day too long to eat raw. In an ideal world, all your fish would be sashimi-grade fresh and you would cook it by choice. I think I would take the term seriously if shopping for fish to eat raw at Safeway. There's no inherent reason you can't eat fish raw from there, but you would want to buy the freshest fish they have. We don't shop for sashimi fish there, but we do buy it at Sun Fat, which would give some people the heebie-jeebies. We trust their freshness, and that's what it's all about. Reardon: We buy a lot of fish at Whole Foods, but we don't usually make sashimi out of it. They will clean a whole fish for you, but they won't slice it up to be sashimi-ready. I don't live near Clement St so I'm sorry but I'm not familiar with the Asian markets there. We like Sun Fat on Mission St, a long way from your neighborhood, but worth a visit for the live oysters -- best selection in town. If you live near Nijiya, though, you need to get more used to it, as their selection and pre-sashimi preparation is as good as anyone's. They also have a good sake selection, though nobody in the store can tell you anything worthwhile about it. The aisles are narrow and on weekends it can be crowded. Think of that as an authentic Japanese experience. I found your post to be most delightful. you mention buying a good sake and soy sauce at the market Niijiya. If you are able will you give me a brand or two? Also, are there jars of fish roe available at the market? Thanks. Nijiya does have fish roe. Sake: wow, that's like naming a good wine or two. But I realize that's not helpful to you. So here are a few favorites: Dewazakura Dewasansan, Nanbu Bijin Junmai Ginjo, Sohomare Karakuchi. I could name so many more, but think of sake like wine: buy it and try it.